Having brushed shoulders with Limerick on two occasions in this year's championship without finishing on the right side, Cork boss John Meyler sees no reason why the Treaty men can't end 45 years of hurt in Sunday's All-Ireland decider with Galway. The Rebels drew with John Kiely's side in the Munster round-robin stages before blowing a six-point lead with as many minutes remaining in the All-Ireland semi-final and eventually falling in an extra-time thriller. Despite a host of All-Ireland U-21 winners from 2015 and 2017 being parachuted into the senior fold in the past two seasons, Meyler feels Limerick are displaying a "calmness" far beyond their tender years, even in adversity, and favours Declan Hannon to bring Liam MacCarthy back to Shannonside. "The impetus is with Limerick, they've shown a maturity all year. If you go back to the league campaign where they beat Galway, they've shown a maturity coming through the Munster Championship," he said. "Kilkenny got the goal in the quarter-final and went two points up and then Limerick came back to go ahead with a couple of points from (Tom) Morrissey and (Shane) Dowling. Then, the fact that we were six points up against them and they came back to go a point up. "They showed that character and resilience and then, the fact that Galway haven't really been firing. They put up early scores against Clare in both games and then they allowed them to come back into it. Galway haven't hit 70 minutes. "If they do hit 70 minutes, they could shade it but overall, Limerick's consistency has been better. You would have said that after the Leinster final against Kilkenny, that's the warning that they've got. They've gotten two matches against Kilkenny, two matches against Clare but they've showed the same type of tendency in both." The 62-year-old was in the firing line in the wake of their semi-final defeat - their third as Munster champions since 2014 - but unlike other inter-county managers detailing poison-pen letters, Meyler insists the Cork public have been "really supportive". He admits criticism is "par for the course" in such a high-profile post and while he is "not over this year yet", a review which highlighted that they "need to improve everything" has been completed and Meyler looks set to take charge again in 2019. Would he make any changes in the closing minutes if he could do it all over again? "I'd have changed the last eight minutes, but I can't do that. That eight minutes needed composure both on and off the pitch. We've looked at that. We've spoken about it. "We've talked about it, but the white heat of battle sometimes it just passes you by and it's gone. You are looking for experience, you are looking for composure, you are looking to close out, and if you won things then that becomes a habit, and we just need to be there constantly at the table." An influx of Munster U-21 winners should boost Meyler's hand next year and after criticism of his substitutions in the latter stages of their last-four clash, the additions of Declan Dalton and Jack O'Connor will greatly assist them. However, Meyler believes the structure of the Munster round-robin campaign and a lack of competitive action for fringe players - with little or no intensive training between games - can scupper their progress and reduce any impact off the bench. "That's the one thing in the soccer, really, when they're playing Saturday-Tuesday-Saturday-Tuesday, those guys are getting sharp. It probably takes those guys six to eight games to get into their full season after pre-season is over," he said. "Guys then that don't play...Reading (whom his son David plays for) are playing in the League Cup midweek, so guys who probably haven't had a game in the first two matches get a game tomorrow night. "So there's ways and means around it in soccer, it's about getting the balance right then in the GAA. 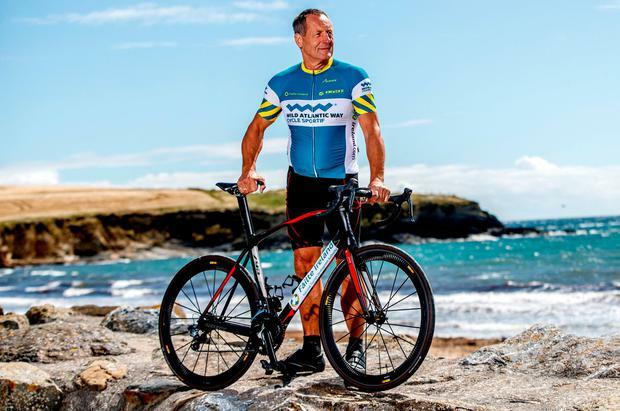 John Meyler has teamed up with Fáilte Ireland and Ride Wild to announce the launch of the September Wild Atlantic Way Cycle Sportif - a multi-stage event spanning over 2,000km - which will take place from September 8-26.